I was so happy to hear the recent news regarding the birth of a baby girl. The baby’s name is Maile Pearl Bowlsbey. You may have heard of her mother. She is Illinois U.S Senator Tammy Duckworth. In the spirit of full disclosure, I live in Illinois so I have had the pleasure of following her career for many years now. Senator Duckworth openly shared the fact that she is 50 years old and had her child with the help of infertility treatment. She repeatedly publicly referenced the fact that she used in vitro fertilization (IVF) to build her family. Senator Duckworth has not shared any more details regarding the type of treatment she had or if she had the help of a donor. I was amazed to learn she is the first sitting Senator to give birth while in office.She has called for a rule change that will permit children under the age of one to be brought to the Senate floor during votes. Senator Duckworth has made it clear that this type of ban does not allow her as a working mom to parent her child and continue to do a job that she believes is important. She has publicly spoken about the lack of support women in the workplace are not given making it so challenging for them to try to build a family, maintain their role as a parent, and in the workplace. She continues to spearhead this cause. In addition to these achievements Ms. Duckworth is a true patriot. She is a retired United States Army Lieutenant Colonel and a retired United States Army helicopter pilot who served in Iraq. It was there that she sustained severe injuries that resulted in the loss of her right leg near her hip and a left below the knee amputation. She almost lost her right arm but doctors were able to save it. The helicopter she was flying was hit by a rocket propelled grenade. She later worked for the Illinois Department of Veterans Affairs. In 2012 she became the first disabled woman to be elected to the United States House of Representatives. It occurred to me as I learned about her daughter’s birth what a remarkable role model she is for both men and women for so many reasons. Her record as a woman warrior who battled infertility and significant disabilities speaks for itself. She has taken these very personal challenges and decided to champion others in similar situations who are in the midst of their own struggles. 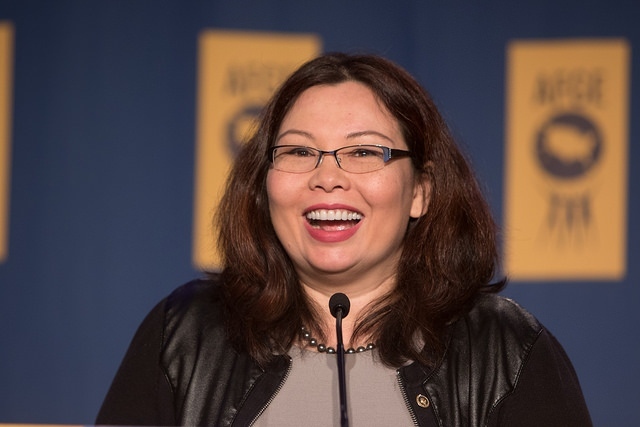 Senator Duckworth has decided to use her seat in the United States Senate to educate her colleagues and the American people about all that this entails. I am struck by the fact that now is a time that we are so divided in many ways. We all can benefit from positive role models. They can lead us through our own individual daily challenges and struggles. We need to know that we are not alone. These role models may be public or people you find in your own life who inspire you. It is wonderful that so many people in the public eye are coming forward to share their personal struggle with infertility. That was not the case 20 years ago when I first started my infertility treatment. I would sneak out of work to find a telephone that I could use to confidentially talk with my reproductive endocrinologist about the status of my infertility treatment. I didn’t feel I could get support at work from my boss or even from colleagues regarding my ongoing infertility treatment and the repeated failures I encountered. I am hopeful that the trend of women reaching out to support each other on many fronts will continue.